You must all be wondering why I’m writing about lizards and not saying much about Ghana. I have been trying to pull my thoughts together I suppose. It hasn’t been easy. We arrived in the early hours of the morning perhaps around four thirty or so. As we glided in I saw below me from my position by the window, swathes of darkness and little dots of light. We came in overland passing perhaps over Mali, the Ivory Coast and on into Ghana. Accra is closer to the Eastern side of the country and so I think I passed over a good bit of the country before we came to the capital. As you can imagine I landed tired and weary from two solid days of traveling. Accra, more sellers than buyers. Despite the obvious attempts to make the airport appear as a modern international one it is only so in external appearance. From the outside the building is impressive but once you get in, there is a drabness that contrasts with the impressive exterior. The luggage carousel is old and stopped quite frequently, so that it took some time to collect all our luggage. In general I was reminded of our own airport in Kingston. By the time we landed I would guess that it was about five in the morning. Going through customs took quite a bit of time and given my level of exhaustion I must say I was barely functioning by then. I make it outside where someone immediately grabbed hold of my luggage cart and mindful of the possibility of theft I hurried to follow the youth. There were no porters in sight and the youth struck me as a hustler. There was no telling what might happen. I got to the exit along with my colleagues and there the confusion began. We have to pay the youth here as he is not allowed to go any further with our luggage. This is fine with me, I have traveled with a purse full of US coins and quickly handed over two dollars’ worth. “We do not use coins,” he tells me. I was digging in my purse for singles when our group leader said we should all pay for everything in one. A huge discussion ensued. I was tired and weary and couldn’t see the point of arguing; he wanted five dollars for six suitcases and one box and I was inclined to give it to him. I was hushed up for reasons related to the fact that I didn’t know the exchange and didn’t realize that I was being robbed and also because, as I was told, when our group leader who is a Jamaican and also a Queen Mother is talking I am to have no say. That was my first introduction to the difference in our status while on Ghanaian soil. It would appear that our relationship as Sistren would have to take a back seat to that of Queen Mother and what? Subjects? Hand maidens? I will have to wait and see what unfolds. Finally, after much bargaining and discussing I was told what to contribute to the final sum and did so quickly, for I badly wanted to rest. We hit the road and I was interested to see that I was reminded of both Jamaica and Nigeria as we drove through the city on the way from the airport. In a short while we were at the house where we are to stay while in Accra but we stayed in only long enough for me to have a short nap. It was still early in the morning when we got on the road to change money and make some purchases. I couldn’t then and still can’t figure out the money, it is so much! One USD is 800.2 Cedis and I have never had to count so much money in my life. I cannot make change, I cannot shop, just the thousands attached to the price of an item is enough to scare me. I remember being in Istanbul and having the same trouble and just asking the cashiers to just take what they needed from my hand. I want to do the same thing here but I wonder about the wisdom of holding out a fistful of cash to a vendor on the street. So far I haven’t bought much. I need time to adjust to this nuff money business. We shopped in areas that reminded me of Lagos, lots of stores with goods spilling out into the streets. It seems that here the wares are only stored in the little shops that look like shacks or kiosks. As soon as it is daylight the goods are brought out on the street and displayed so that the customer can actually see what is offered in each store. The streets are wide and there are lots of people about. It was probably 10 or 11 by that time and the streets were crowded with most of the people appearing to be vendors of one thing or another. I don’t yet have an ear for the accented English but I finally figured out “cool water” among the items that were called out by the vendors – youngsters who should be in school. As we shopped I kept thinking of that song by Half Pint “more sellers than buyers”. Everyone we passed was selling something. 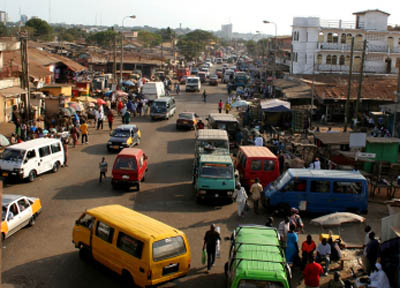 I think that if Accra is indeed a city of sellers, it may also be true of the nation as well. I passed fruit stands, clothing stands, hardware stands, and food, food, food, being sold from stalls. Many shops in the city are painted red, green and gold and that first day I was so out of it I kept saying, “Oh praises! RastafarI have a strong presence here!” It was a couple of days later before I recalled the fact that the colors of the Ghanaian flag is red, gold and green; so much for my assumptions of a strong Rasta presence. In contrast to the shopping area where we spent the first morning, I find that we live in a residential area, called East Legon. It borders the University of Ghana and is typified by huge mansions, many of which appear to be empty. It is apparently a newly developed and developing area with much wider streets than some I have seen. I haven’t met a lot of people yet, and knowing how I like a little space between every activity to absorb and analyse what’s going on around me, I am not worried. When I walk out to the main road to try to make phone calls I attract a lot of attention: could be the foreignness, could be the locks, could be the color of my skin. Yes that look is in over here too, brownings rule apparently. How did we get so messed up? Brown skin and long hair apparently is the preferred form of beauty here. I see evidence of facial bleaching and I see bleaching creams in the stores. I definitely want to learn more about this practice. Everything moves slowly here and I can see that I will have to slow down to keep pace with the flow of Ghanaian life.